I love living in the South. There is just something about it. Laid-back but high energy. Sweet and sincere with a little bit of sass. And the food. Ugh. The food is so freaking delicious it’s not even funny. Or fair. Particularly when you’re trying not to indulge in all of the amazing dishes offered. Especially in the lovely city of Memphis when on Fridays I can smell pork wafting down the street when I walk outside. We are definitely known for some staples down here. BBQ. Fried Chicken. And quite frankly, when you’re in a restaurant serving either of those staples, you tend to find a lot of calorie-laden sides to accompany it. French fries. Fried pickles. Fried tomatoes. Mac and cheese. Creamed corn. It’s almost like you don’t even have a fighting chance to be healthy. Well, a few weeks ago I came across a recipe for creamed corn that sounded delicious – and actually not loaded with fat. Now I am picky about my sides – I can justify splurging a little on a main course, but I have to really be impressed by a side dish. This is definitely one of those recipes. I’ve had creamed corn before – and it has just seemed bland. But the fresh herbs and red peppers really jazz up this recipe. Give it a try – we are definitely fans and have made it a few times already. Melt your butter in a small saucepan. Add bell pepper and thyme and saute 2-3 minutes. 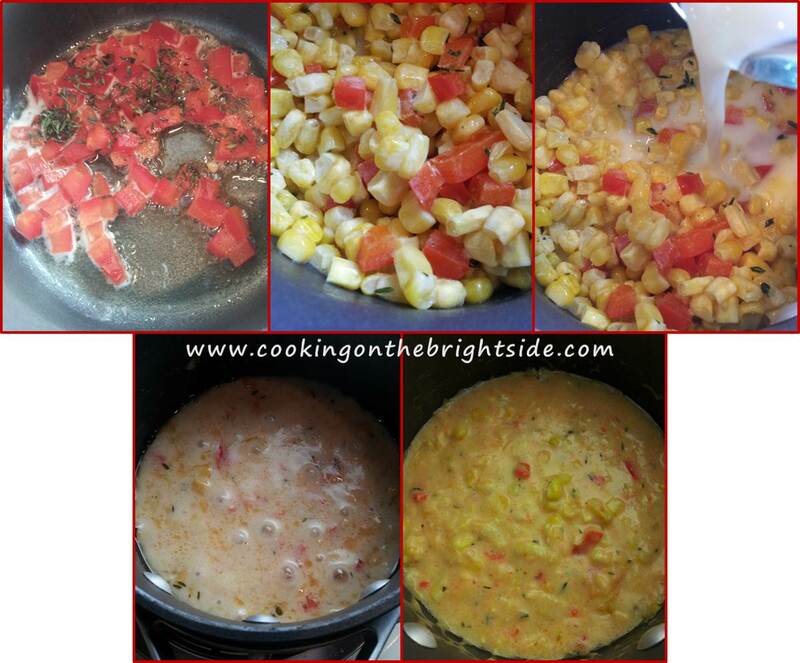 Add corn kernels and stir to coat. Whisk in milk, salt and flour. Cover and bring to a boil, reduce heat to medium-low and simmer 10 minutes. Remove half of the corn mixture and add to a mini food processor, pulsing a few times. Return to saucepan and stir well, simmering another minute or so. 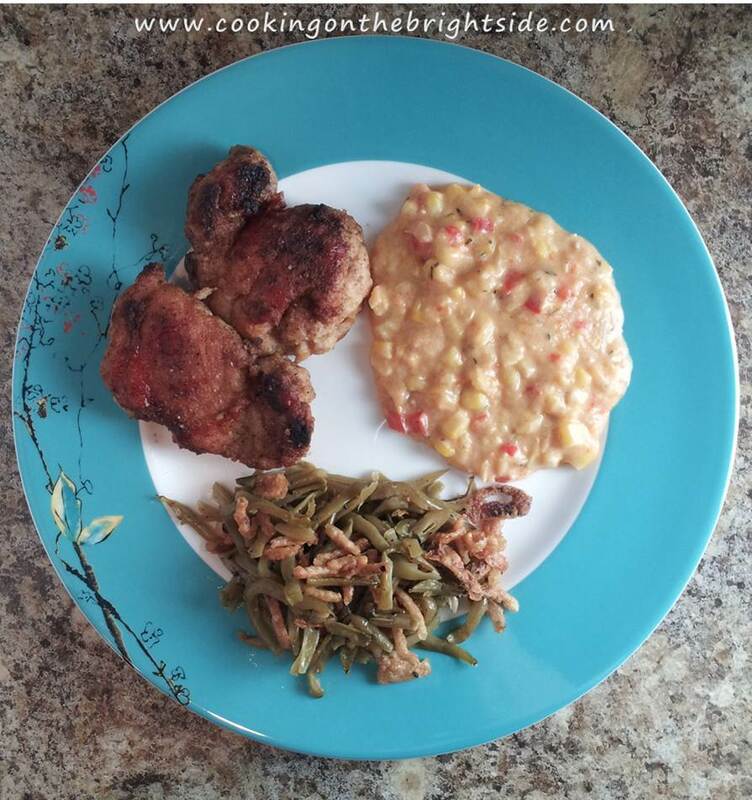 I served this with another Cooking Light recipe for pan-fried chicken thighs – a first for me. It was absolutely delicious and I didn’t feel the least bit guilty after licking my plate. 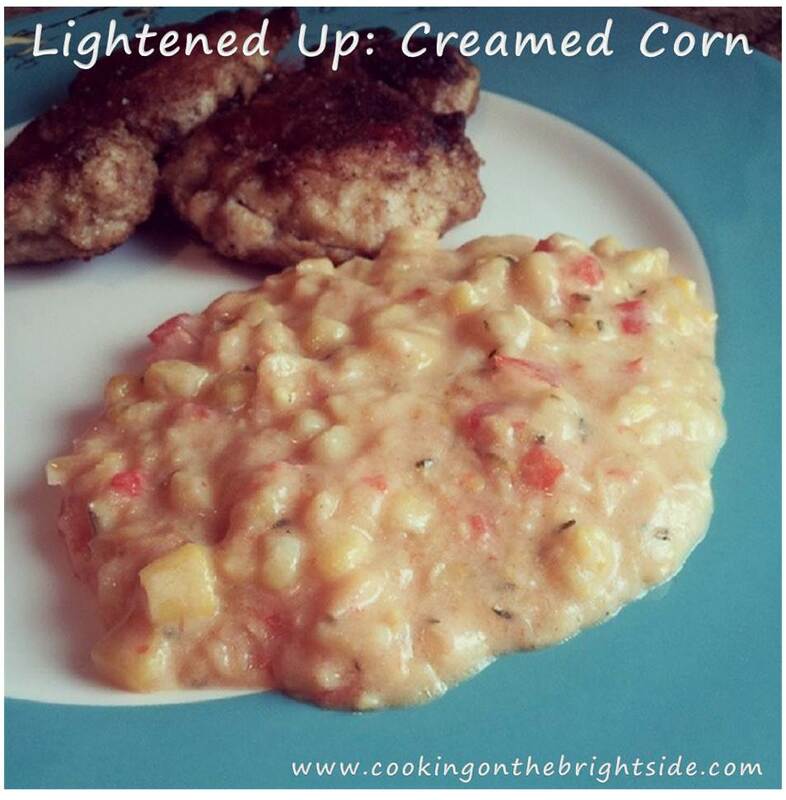 This entry was posted in Side Dishes, Vegetables and tagged light creamed corn, low fat creamed corn, weight watchers creamed corn, weight watchers side dish by cookingonthebrightside. Bookmark the permalink.